Learn Dr.Harvey Karp’s techniques for effectively soothing your fussy baby. Discover the missing 4th trimester and the calming reflex. Practice proven strategies for putting your baby to sleep and helping them stay asleep!! Learn The 5 S’s System: Swaddling, Side/Stomach Position, Shushing Sounds, Swinging, and Sucking plus The Cuddle Cure. 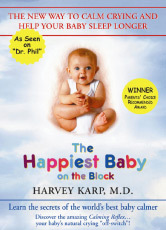 Dr. Harvey Karp is a nationally renowned pediatrician and child development specialist who has taught thousands of parents, from working moms to superstars like Madonna his secrets for soothing colic, boosting infant sleep, reducing tantrums, promoting patience and… making parents and children happy. Dr. Karp’s work is translated into over 20 languages and is taught by specially trained and certified educators like Cathy Collyer. Live outside the NYC Metro area? Read the book/watched the dvd but still have questions? Want more support to use THBOTB because your child is medically fragile or has special needs? Get connected with Cathy using phone support sessions!! Use your phone, FaceTime or Skype for 30-minute sessions to learn more about newborn calming and sleep using THBOTB. Receive personalized instruction at a convenient time and place for your family. After your on-line purchase is verified, you will be quickly contacted to schedule your first session. Cathy teaches you to use gentle massage to calm and soothe your baby for better sleep, relief from colic and constipation and give a natural boost to their immune system. Cathy has experience working with full term, premature and NICU babies and tailors each session to your baby’s needs. Vocalization, eye contact, and other behavioral techniques are also taught. Infant massage training helps reduce stress and post-natal depression. Infant Massage is all about learning to nurture and communicate with your baby through touch and is a great hands-on opportunity for new fathers to get involved with their newborn. Over the past decade, the “Back to Sleep” campaign has decreased SIDS deaths by ~50%. However, SIDS continues to kill ~1/2000 infants/year in the US and, as mentioned in the AAP Task Force report on SIDS, we must look as hard as we can at other promising interventions to reduce SIDS incidence (which has plateaued over recent years).